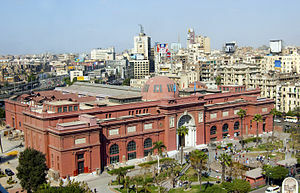 The Museum o Egyptian Antiquities, kent commonly as the Egyptian Museum or Museum o Cairo, in Cairo, Egyp, is home tae an extensive collection o auncient Egyptian antiquities. It haes 120,000 items, wi a representative amoont on display, the remainder in storeruims. This page wis last eeditit on 9 Mairch 2018, at 22:06.